1. View our outage map. A circle on the map near your address may confirm an outage in your area. 2. Treat every power line as if it’s hot and dangerous. Keep employees and customers safe and at least 30 feet away from any downed power lines. Wires don’t have to be touched to hurt someone – water, metal, tree branches, concrete and other materials can conduct electricity. 3. Check for blown fuses or tripped circuits. 4. Look to see if neighboring businesses are out of power. 6. Turn off electrical equipment, especially machinery with motors. Not only will this help prevent damage to your systems, it will help us avoid overloading the system when power is restored. 7. DO NOT operate machinery if ventilation or safety systems are down due to the outage. 8. Keep refrigerators and freezers closed to minimize food loss. See the USDA and Centers for Disease Control websites for food safety information. 9. Use your phone (you can charge it in the car) or tablet to follow us on Facebook and Twitter for outage information and updates. 10. Use generators safely. Improperly installed generators can seriously injure our crews. 11. If you notice power is restored to neighboring businesses, but yours is still out, call us again at 253-502-8602 and report your location. The problem may be isolated to your location. Also, remember to prepare for an outage at home. Regularly educate employees about your response plan should your business lose power. Remember to plan for incidents during which customers may be present. 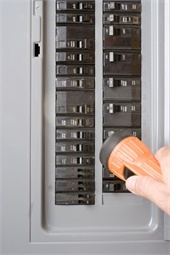 Ensure employees know where to find electrical panels and how to shut them off. Keep a list of equipment that could be affected by a power outage and should be turned off, such as computers, security systems, and heating and ventilation systems. Make sure employees know how to turn off critical machinery. Check generators and emergency lighting systems to ensure they work. Have emergency lighting, such as flashlights, ready and available in common working areas. Computers: Protect them with quality surge protectors. Back up data often and store information in a secure, off-site location. Consider installing an uninterruptible power supply (UPS), a battery back-up system designed to switch your computer to emergency back-up power so you can work through brief power outages without losing data. A UPS also provides protection from voltage sags, or short-term decreases in the voltage level. Motorized equipment: Turn off electrical equipment, especially machinery with motors. Not only will that help prevent damage to your systems, but it will also help us avoid overloading the system when power is restored. Electronic door locks, security systems and registers: Ensure you can operate them manually. Turn on the most critical equipment first. Wait 10 to 15 minutes before turning on other equipment to avoid overloading the system. Check the facility to make sure everyone is safe and machinery is operating properly. We may require repairs to damaged service equipment before power can be safely restored. You are responsible for damaged electrical service equipment at your home or business. Only a licensed electrical contractor should attempt to work on these parts of your electrical system! An electrical permit will be required. Let Tacoma Power’s storm restoration crews trim and remove trees and branches in the utility right-of-way to the extent necessary to restore electrical service. You are responsible for removing and disposing of any fallen limbs and trees or debris on your property caused by storm damage.